Cast: Chris Pine, Zachary Quinto and Benedict Cumberbatch. Here is Yellow Magpie’s Star Trek Into Darkness film review. Star Trek Into Darkness is a film with enormous potential. It more than succeeds in creating a mesmeric, living, breathing world that seems within touching distance of our own future. Its mix of old and new technologies is masterfully done and the viewer is transported into a future that we can empathise with despite the clear technological gap. The crew of the USS Enterprise has lost its captain and first commander due to a reckless move on a planet inhabited by a primitive tribal people. Alerting this stone age culture to the presence of a star ship costs Captain James Kirk his command and First Officer Spock is transferred too in this botched mission. Meanwhile Earth is inflicted with unprecedented terrorist attacks as a former Star Fleet officer rages a one-man war on the space-faring organisation. The opening scene in Star Trek Into Darkness is breathtaking and visually stunning. Surreal colours propagate the screen as we bare witness to aesthetic marvels that continue to delight us throughout the film. 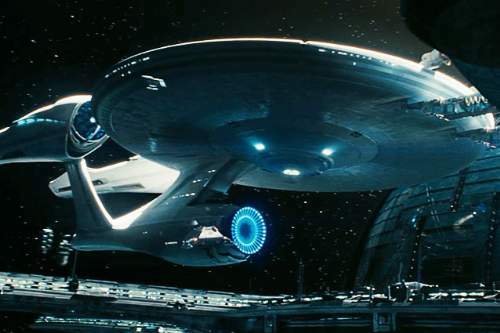 The USS Enterprise also appears like we have never seen it before and the coming of age of CGI and visual effects make this Star Trek film sparkle and come alive in ways never viewed before in cinema. The plot of the film is solidly executed and engrossing however the script itself, and especially the dialogue, is at times sub-par and lets down the high standards the movie creates. The acting performances in Star Trek Into Darkness are mixed. There is a clear gap between the actors playing the antagonists and those crewing the Enterprise. With one or two exceptions, for the most part the Enterprise actors, hampered by a clunky script, are disappointing. 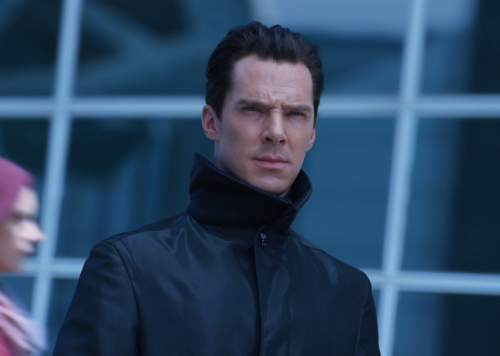 Benedict Cumberbatch’s Kahn is the undoubted star of the film. Conniving, feral and magnetic he hoovers up the viewer’s attention. Unpredictable, one moment he manages to effortlessly lure in the viewer with the merest hint of a smile the next his psychotic personality is causing mayhem. A rare talent, Cumberbatch imbibes the character’s mesmerising disposition. 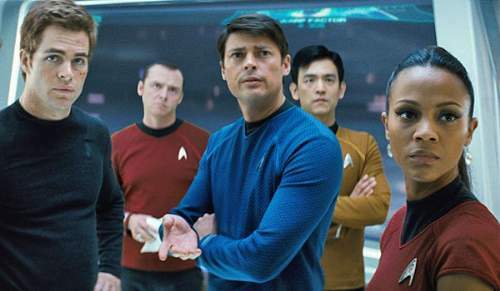 The bulk of the main USS Enterprise cast comprise the weakest actors in the film. 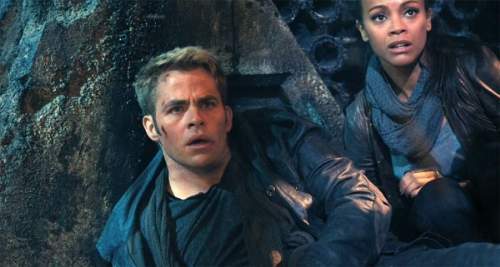 Chris Pine comes off poorly compared to the previous incumbent of the James T. Kirk role, William Shatner. Pine just lacks the ability to show commanding authority. His youthful appearance also goes against him as without an aura of gravitas he looks far too young to have even being considered a Star Fleet captain. Zachary Quinto’s Spock is the most impressive of all the senior Enterprise crew. He gives a disciplined performance as the emotionally suppressed Vulcan. John Cho’s Hikaru Sulu is unfortunately given far too little screen time. Together with Quinto, he is easily the strongest male actor in the main franchise cast. Playing a likeable character Cho makes a bigger impact than what his paltry screen time would ordinarily merit. Karl Urban as Bones, like many others, suffers from having to deliver misplaced quips at the most inappropriate of times. Urban fails to make an impression and his performance is forgettable. Alice Eve is very lacklustre too in the role of Carol Marcus. In a poorly written part that was probably completely unnecessary it appears Marcus’s main role is to appear in her underwear. Anton Yelchin as Pavel Chekov falls victim to the ridiculous need to conform to the original depiction of his character. What results is a ghastly accent that draws zero laughs and completely ruins the credibility of the character. It may have been funny to laugh at a Russian accent in the 1960’s but it certainly isn’t now. Though the writers should take responsibility for this, Yelchin must be culpable too as he is playing the part. Simon Pegg’s portrayal of Scotty leaves a lot to be desired. Tasked with quickly flicking between the serious and the comic Pegg struggles to keep up. Once more this is a case of forcing actors to remain faithful to how other actors portrayed these characters nearly half a century ago. It is to Pegg’s credit that he manages to make Scotty likeable but the character doesn’t play to the actor’s strengths. Zoe Saldana’s portrayal of Nyota Uhura is one of the strongest. A talented actress, Saldana puts in a good performance. Although it must also be said that Uhura’s onscreen relationship with Spock fails to go anyway and remains underdeveloped. Peter Weller produces a strong performance as Admiral Marcus. A dominant presence his character remains inexplicably underutilised. Without spoiling the film Marcus is criminally inchoate for someone with such a prominent role. 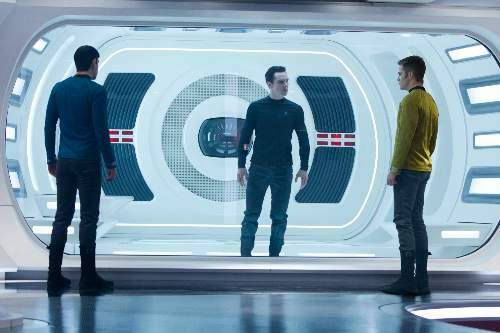 Star Trek Into Darkness has two major problems that take away from the spectacle of the film. The first is the poor calibre of its leading actor and the second is the ham-fisted attempts to pastiche the original 1960’s series. Chris Pine is not a strong enough performer to be given such an authoritative part. And it seems that he will continue to be a weak link in the franchise unless future scripts are deftly written to compensate. The second problem is a question of honesty. The original Star Trek was a product of its time. For the 1960’s it was a wonderful television serious but if you were to rerun it on prime TV now the reality is that very few people would watch it. The story-writing and dialogue would be miles away from what is required today. Secondly, the weakness of the actors occupying the secondary roles would be painful to watch for a modern audience. The plot of Star Trek Into Darkness is excellent. 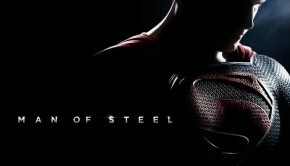 It is a pity the script isn’t as well-executed as it should have been. The biggest dilemma is that the film-makers are trying placate the past while producing a film in the present. As we all know you can’t live in the yesteryear. Even with the scripting flaws and the acting problems this film has so much going for that it can self-right itself. The power of the visceral visuals and the carefully created world with its future setting, that is at once exotic but familiar, contributes to an iconic film. Star Trek Into Darkness is well-worth watching. You may wish to read Iron Man 3 Film Review: A High Point In Cinema Blockbusters, Oblivion Film Review: Raising The Bar For Science Fiction Films and Olympus Has Fallen Film Review: Strong Contender For Worst Film Of 2013. You can obtain Star Trek Into Darkness here from Amazon. For people living in Ireland or the United Kingdom, you can access: Star Trek Into Darkness from here. For Canada: Star Trek into Darkness . 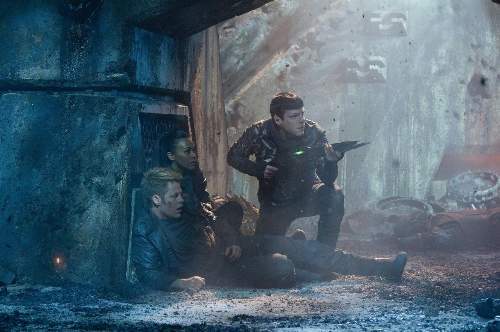 For Germany: Star Trek Into Darkness . For France: Star Trek Into Darkness .